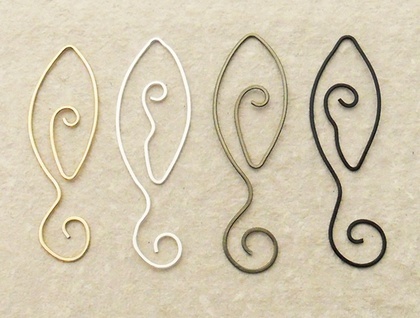 These leaf-shaped bookmarks are made of twenty gauge, non-tarnish artistic wire, which I shaped by hand and then hammered on an old panelbeating block that belonged to my grandfather. The block has a rough surface, giving the bookmarks a slight texture on their flat surfaces. The hammering flattens the wire, so that it will sit as flat as possible between the pages of your book, and also hardens it. Because I shape the bookmarks by hand, using just my fingers and pliers, each one is slightly different, as can be seen in the photographs. 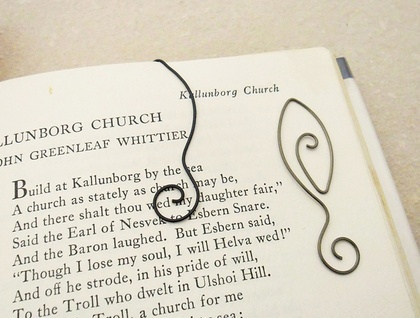 The ends of the wire are filed to remove any rough edges that might damage the pages of the books that they will live in. 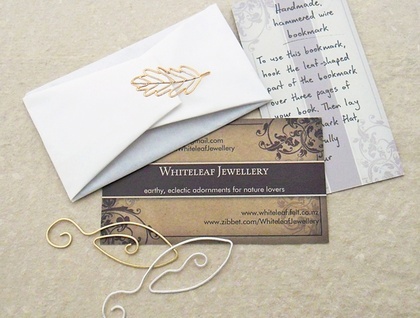 The bookmarks are available in four colours: gold (brass), silver, black, and bronze. The gold coloured wire is brass based, while the others are copper based with a durable coloured coating. Each bookmark measures approximately 50-60mm long and 16-20mm across at the widest point. To use one of these bookmarks, hook the leaf-shaped part of the bookmark over two or three pages of your book, lay the bookmark flat, and carefully close your book. As shown in the photographs, the bookmark will sit almost flat between the pages, a bit like a paperclip. To make sure that these bookmarks wouldn’t fall out, I put one in a book, then shook the book, flipped through the pages, and tossed it upside down on my bed. The bookmark stayed exactly where I had put it. A friend and I have used these bookmarks for months, and we've had no problems with losing them, marring of pages, etc. This listing is for two bookmarks. You can choose your colour or colours by leaving a message in the ‘notes for whiteleaf’ field that will appear when you check out of Felt. If no colour/s are specified, I will choose two bookmarks for you. If you would like more than two, simply send me a message using the 'contact' link here in my Felt shop, and I can set up a custom listing for you to purchase. The bookmarks will arrive individually packaged in tissue paper, with a little card explaining how to use them. If they are to be a gift, you can unwrap the bookmarks to slip them into a card or a book as a little additional present, or pop them, still wrapped, into a card or parcel for posting. Being flat and lightweight, they make wonderful little gifts for sending overseas, or for slipping into a greetings card as a ‘thinking of you’ present. 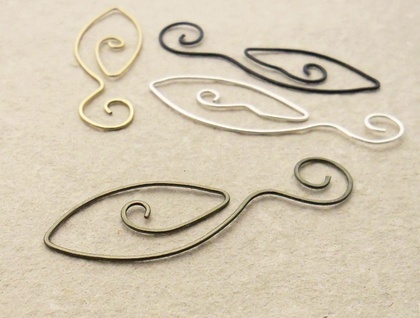 These bookmarks would also make neat little wedding or party favours. If you are interested in purchasing a bulk lot of bookmarks, feel free to send me a message via Felt.